Coordinators: Dishion Thomas J., Snyder James J. Coercive interactions and conflict are commonplace in close relationships and families, friendships, and teacher-student relationships in schools. Coercion and conflict can be used to grow stronger relationships, or they can lead to the deterioration of relationships, undermine efforts to socialize and teach youth, and lead to the development of mental health problems in children and parents. Coercion theory helps shed light on how these daily interaction dynamics explain the development of aggression, marital conflict, depression, and severe mental health problems in families and how they undermine school safety and effectiveness. 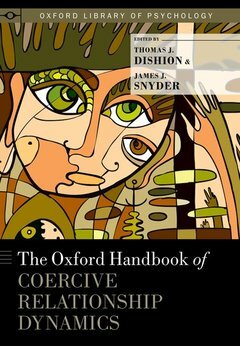 The Oxford Handbook of Coercive Relationship Dynamics features the most recent, innovative applications of coercion theory to understanding psychopathology, developmental theory, and intervention science. The volume provides a multidisciplinary perspective on coercive processes, origins, and social functions to anchor coercion theory from multiple perspectives and to lay a theoretical and empirical foundation for innovative expansion of the coercion model to new areas of research. The volume gives specific examples of how the basic coercive processes underlie the development of significant suffering in children and families, and chapters include clinically oriented discussions of research on the role of coercion in the causation and amplification of problem behavior and emotional distress. The internationally renowned authors of this volume highlight scientific advances in the study of coercive dynamics in families and close relationships, account for physiological and genetic correlates of coercive dynamics, and discuss the application of coercion theory to effective interventions that improve the quality and well-being of children, adolescents, and adults. This volume is an invaluable resource on behavioral science methodology, developmental theory, and intervention science. Thomas J. Dishion, PhD, is Professor of Psychology at Arizona State University. He has conducted translational research on child and adolescent mental health for over 25 years. He has worked on theoretical models of child and adolescent socialization, family and peer interaction methodology, child and adolescent substance use and problem behavior, adolescent depression, family-based intervention, behavior-change theory, prevention science, dynamic systems, and most recently social neuroscience. James J. Snyder, PhD, is Professor of Psychology at Wichita State University. He is both a clinical and developmental research focusing on the social interaction patterns in the development of aggression and antisocial behavior. He has contributed to methodological advances in direct observation methods as well as the analysis of social interaction patterns. His research focuses on the development of psychopathology during childhood and adolescence from the perspective of socialization in family, sibling, peer, and school environments.